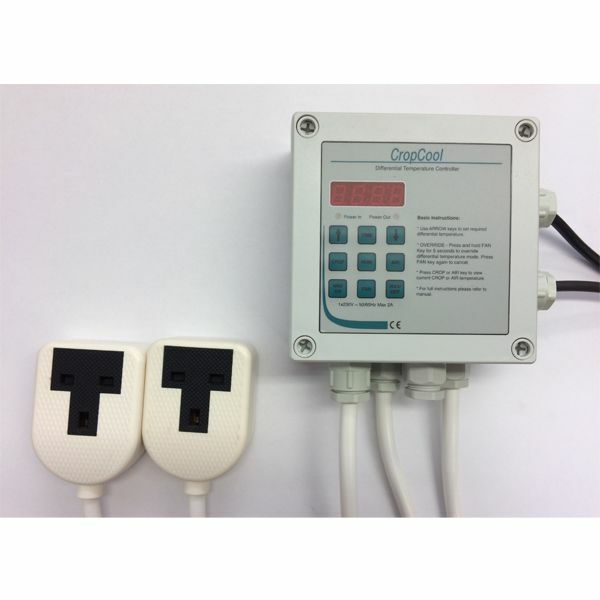 A differential temperature controller to automate two single phase grain cooling fans, speeding up grain cooling times and saving running costs. Crop temperature is measured with a 2m fiberglass temperature probe (supplied) with a 20m extension cable to connect it back to the CropCool controler. With the air being measured by a sensor on a 4m cable. The unit comes with 13amp plug and 2 13amp outlets to run 2 fans. The system is easy to operate and it is also available for 3 phase fans. Output: 2x 230v 13amp sockets. Max. 1.1Kw each. Can I run more than 2 fans with a Cropcool? No. The cropcool is designed to run 1 fan per outlet with a maximum motor size of 1.1Kw. If the outputs are overloaded there will be a risk of blowing internal fuses or causing damage to the circuit board. Can I use a CropCool with extension leads? The CropCool should be plugged directly into a quality 13amp wall socket as most extension leads will be insufficient to provide the correct power requirements. A suitable extension lead(s) (minimum 2.5mm2) should be plugged into each CropCool outlet to run each Fan. In most cases it is not necessary to have humidity control for running low volume ventilation (pedestal) fans. With Low volume ventilation it is hard to ‘re-wet’ grain once dry, even if the air is damp or it’s raining outside. When operating the Differential Temperature Control to Cool Grain, the Fans are only switched on when the Air is Cooler than the Grain. Since Cold Air (in most circumstances) carries less moisture than Warm air, it should not be possible to wet the grain. The only exceptions to this rule are if there is super saturated air, such as Heavy mists, ‘sea frets’ near East Coast, or places where heavy mists are experienced. 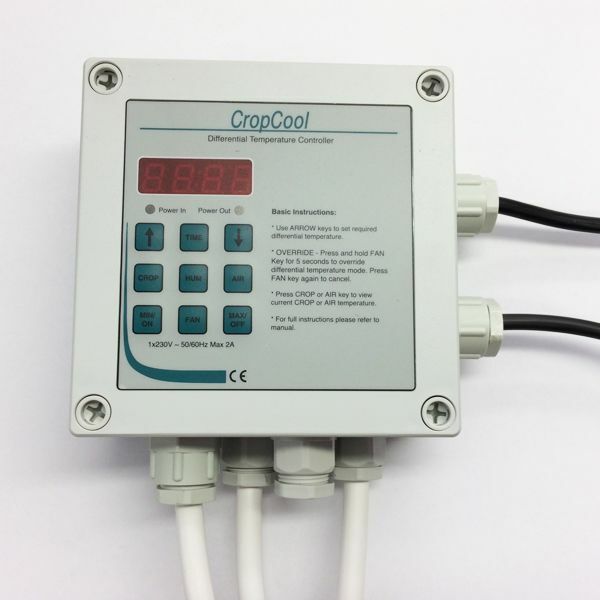 If you want to use the RH function of the CropCool then it can be supplied with a Humidity sensor when purchased, (or can be easily retro-fitted by customers to an existing CropCool). Can I run 3phase fans from a CropCool?